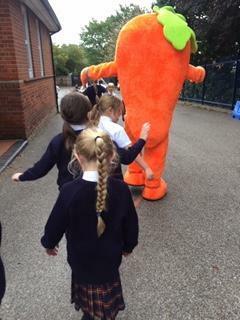 The fabulous weather this week was incredibly timely for our first ‘Walk To School and Be Healthy Week’ with lots of families making a big effort to walk to school. We kicked off the week with Year 4 running a mile and Mr Eggleton managed to set up music in both playgrounds, which the children thoroughly enjoyed; they were showing us some great dance moves. Even the die-hard footballers joined in! Our new Year 6 officers have been enthusiastically handing out raffle tickets and organising different sporting challenges at break times. As always, Groovy Shoesday was welcomed by the children, who enjoyed wearing their favourite shoes and slippers; we raised a great sum of money for the JDRP charity, which funds research into Type 1 diabetes. 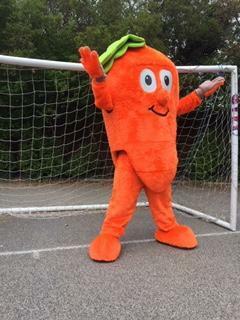 Without doubt, the highlight of the week was a life size CoOp carrot, which came to school, played football and did some aerobics; the children absolutely loved it! We were very grateful to The Co Op for their generosity in donating a large variety of fruit: bananas, apples, pears and plums, enjoyed by all the children; it was a great way of promoting healthy eating. Many children appeared to have a lot of fun taking part in our ‘healthy animal snacks’ competition sponsored by the Co Op; winners will be announced next week. 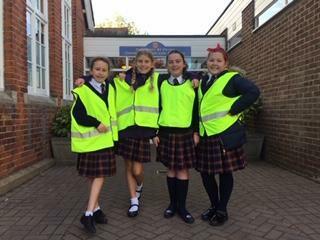 To close the week, Year 6 delivered an assembly on ‘Road Safety’, Mrs Alburg organised an inter-house basketball challenge and the traditional conga looped around the playground at lunchtime. We would like to extend our thanks to all families who took part this week and our local neighbours who kindly supported it. Keep exercising and eating healthily! Well done Mrs Botia for your endless enthusiasm in organising such a memorable week! Life Bus came to school this week for Years 4 and 6. Kay, our instructor talked to the children about how to keep fit and healthy. The children were able to see a life size interactive dummy with internal organs which lit up when pressed. They enjoyed learning about the circulatory, respiratory and nervous system. Kay also touched upon the effects of alcohol and smoking, in a child friendly way. Finally, through a fun video allowing them an imaginary journey to another planet, they learned about the benefits of being unique, having rules and staying together to help each other. 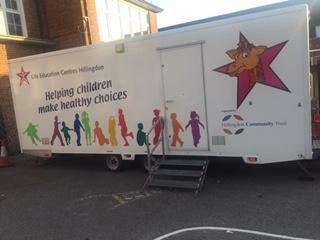 The children responded very well in the Life Bus and they were all talking about it at break times. Our thanks go to the Misbourne Matins Rotary Club, which contributed towards the cost.